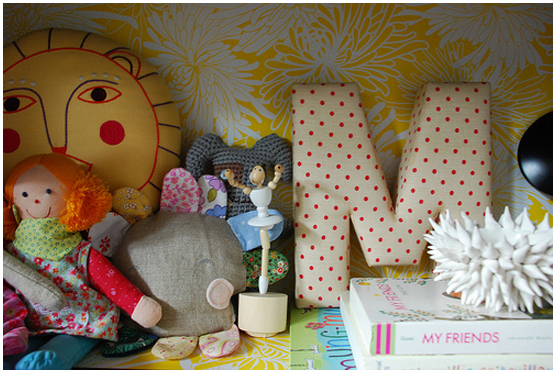 A little while ago I e-met Joslyn Taylor from the always inspiring design blog, Simple Lovely. Joslyn told me about her house and her passion for decoration and of course I was curious to see and know a bit more about her home ... so she send over some great images of her house, mainly from her daughter's great rooms, because that's what we like best here at B:Kids ... have fun! 1.) 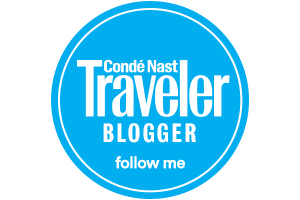 Hi Joslyn, we would love to hear a little bit more about you what you do and what made you decide to start a blog? I was a little late to the blogging game…while on maternity leave with my second daughter Amelia (now 21 months,) I stumbled upon a few design blogs and was hooked. I love the instant access to so much inspiration and the ability to form little communities around common interests, tastes, etc… After a few months, I wanted to join the conversation in a more visible way and launched Simple Lovely as a place for me to catalogue the things that inspire and delight me + to serve as a sort of online reminder to be more mindful in the things I purchase and how I structure my days. 2.) What kind of house do you live in and with whom? Is this your ‘dreamhouse’ and what do you really like about it? 3. 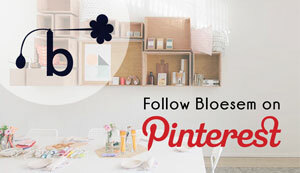 )How do other blogs influence you when choosing items for your own house? 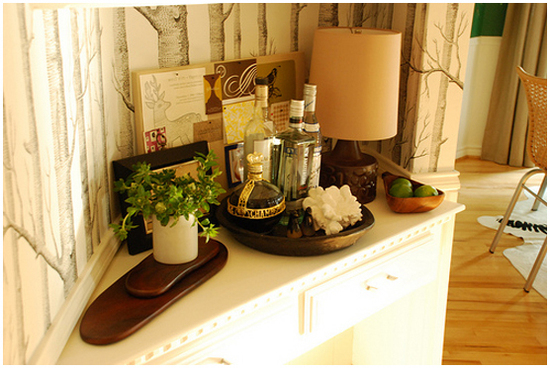 Why did you decide to give your kitchen a green wall and other the side wallpaper with trees? There are so many amazing blogs out there that between those and the décor magazines, I almost get “inspiration overload.” I’m definitely most inspired when I see an object or piece of furniture in context, so I especially love home tours on blogs. I’m addicted to seeing how others treat particular objects in their homes. Our kitchen is a really unusual space with a main cooking area and then an odd little nook that leads into a sort of breakfast room. 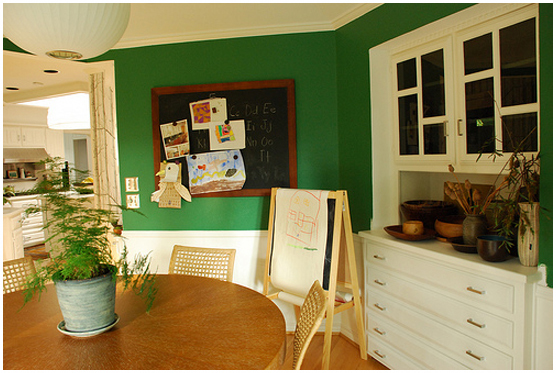 I chose the green paint first, shortly after we moved in, as the breakfast room is all windows and looks out onto several large trees. I tried to match the color of the trees and grass with that green. Recently I decided to add the paper to the nook so it would feel like you were walking through a little forest to get to the table. All of my friends and family were a bit skeptical, but I’ve always loved that wallpaper, and I had a feeling it would be cool…So far it’s my favorite thing we’ve done in the house. 4. 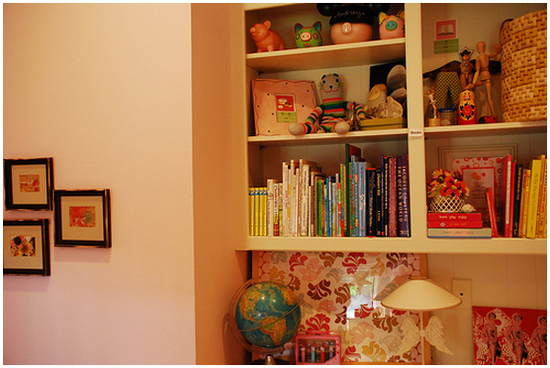 )Do blogs inspire you to be creative and decorative in your daughters rooms? I get loads of inspiration from blogs for the girl’s rooms, as I’m even more willing to take chances and do unusual things in these spaces. Right now they’re both pretty tame, but we have big plans in the next year to turn one room into a cozy sleeping space and the other into a great playroom, art space, so I’m sure we’ll think outside the box a bit to make that work. 5. )Can you tell us a bit more about the prints on the wall? Is this a connected bathroom, that must be very handy? The prints in Millie’s room include a mix of vintage prints, a LOVE poster from Made by Girl draped with a little strand of butterflies by Royal Buffet and a framed postcard I picked up at Rose and Radish in San Francisco. I especially love finding groovy thrift store art or framing the girl’s scribbles and drawings. 6.) 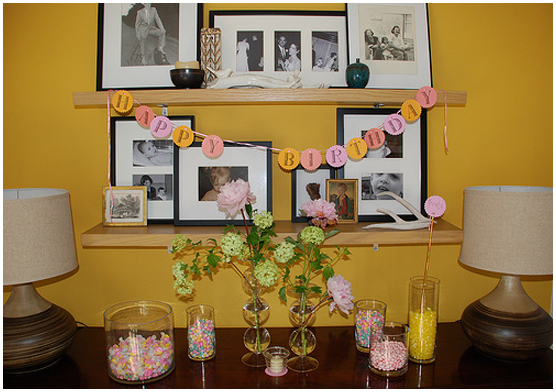 Why did you choose the colors grey and yellow for Amalia’s room, which accessories do you and perhaps she too really cherish? I wanted Millie’s room to feel feminine, but we’d already gone with pink for Audrey, so I started with that grayish lilac on her walls and yellow just seemed like a natural compliment. I’m not sure she’s old enough to really treasure anything yet, but I love all her different softies. Each one has a story and feels sentimental to me in some way. 7. )Where did you find the lamps, are they vintage? 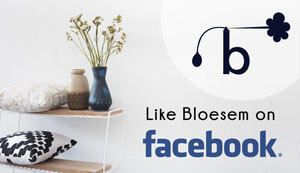 Are you a fan of vintage items or do your prefer new ones? 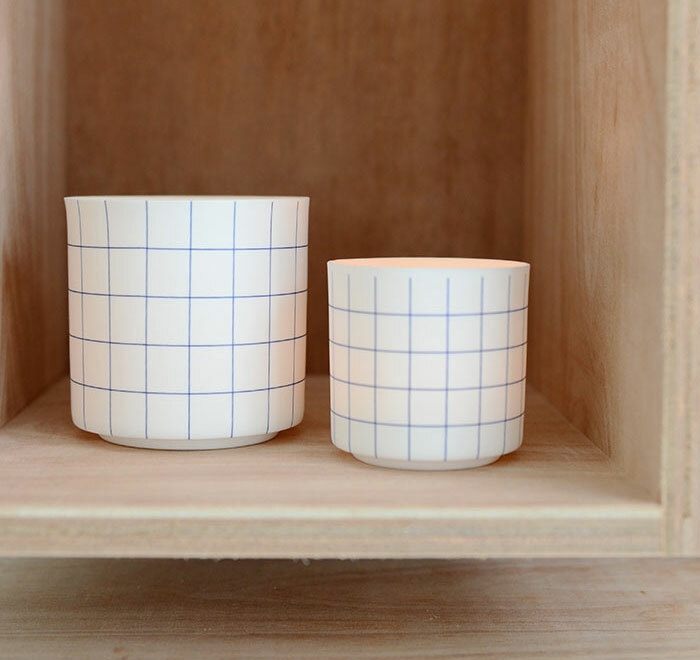 What online shops or sites do you love to visit when shopping and finding ideas for your home… and what are the little things in the glass jars? The lamps may have been one of my best finds ever. They’re from the clearance table at Target a couple of years ago, and I think they could pass for 70’s pottery. I love vintage pieces. To me, adding healthy doses of vintage in your home gives it soul and character. I love things that have a history, but I think it’s important to balance it with newer stuff, especially in a 70’s house like ours, or it might feel like we were living in a time warp. 8. )Such a great wall with art, where do you find your art and what exactly are the red ‘Moroccan like’ stools? 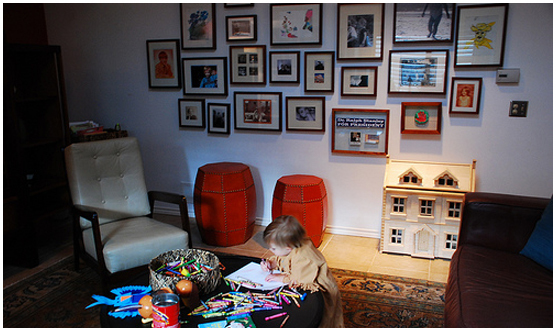 Actually most of the items on that den wall are family photos mixed in with art that someone in the family did. I’ll frame pretty much anything… Millie’s scribbles, a concert ticket, in fact my favorite piece on that wall is a cowboy that Bryan’s father drew and Audrey scribbled over by accident. The orange nail head stools are actually storage for all of our legos and other odds and ends that the girls play with. 9.) 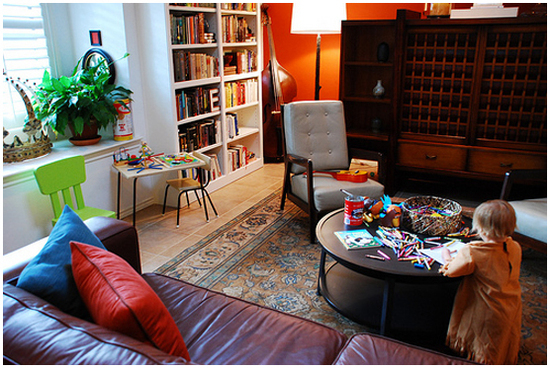 Is this the family room, can you tell us a bit more about it? The den is where we spend most of our time as a family. It’s sort of a library, art room and TV room. I wanted it to feel cozy so we added the orange wall + it had to be practical, so all of the furniture (including the indestructible metal coffee table) is super easy to clean. 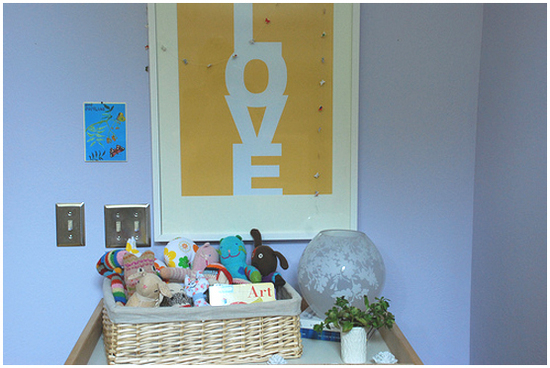 When we moved in we had built-in bookshelves added around the window seat, and since loads of toys end up in this room by the end of each day, bins like the stools mentioned above are pretty essential to keeping the space tidy. 10. 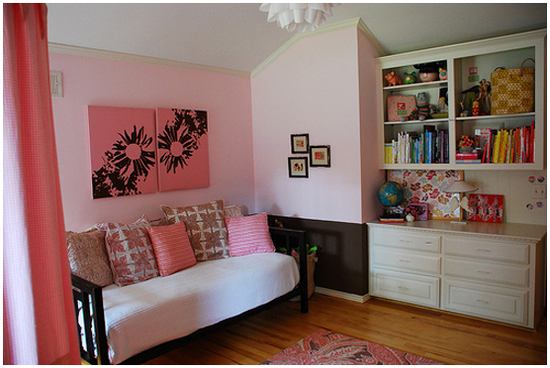 )Pink, pink … I love pink for girls and I guess you do too, where did you find the pillows on the couch? I do love pink, especially when it’s tempered with a strong dose of a more masculine color like grey, orange or brown. All of the pillows on her daybed are John Robshaw. 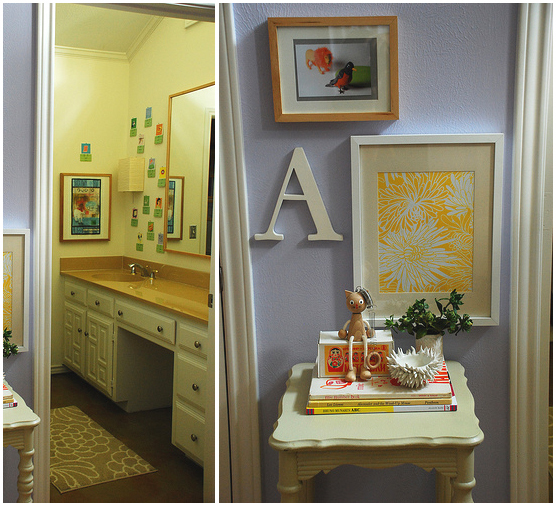 I’m a big fan of using “grown up” pieces in a child’s room. 11. )Does Audrey like to read books and is it something you encourage, what are her favorite activities? She is a huge reader…we all are. We read together every night our books are our treasures. 11.) 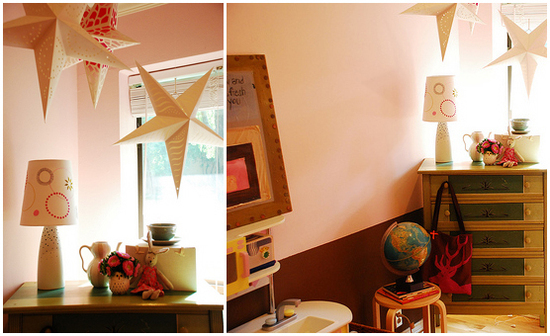 I really like the paper stars, do you actually use them as lights in the room and finally what can an experienced decorator as yourself advice to anybody who would like to re-decorate their own house? The paper stars are just decoration…I’m pretty obsessed with hanging paper lanterns and whatnot from the ceilings all over the house, I might have to move away from that eventually. The advice I would give to someone as they embark on decorating their own home is to go slow…every time I rush, I make decisions I regret later. If possible live in a space for a while to see how you actually use it, have fun, don’t try to copy someone else verbatim, rather take in inspiration and make it your own… Your house is your home, a reflection of you and your family, make it work for you and don’t worry about what anyone else thinks! ..if you have a question for Joslyn?..